Before getting into this fourth, and last, installment introducing Custom Print Products, let’s recap a bit. Custom Print Products is the printing branch of Lloyd’s of Indiana. We sell printing equipment and supplies to many fine print shops around the country, so we didn’t want to step on their toes and compete. Our focus for CPP has always been the large jobs that smaller shops tend to outsource. We can certainly print business cards, but that’s not what we like to do. In the previous posts we talked about the wide variety of products we provide, like trade show graphics and vehicle wraps. In this one, let us dig a little deeper into large format printing. So, when we talk about large format graphics, we mean large. You can imagine such machines would be both cost and space prohibitive in most print shops. Custom Print Products has built a strong partnership with our print shop clients by offering low reseller pricing on projects they just can’t provide their own clients without us. Since it’s not convenient for most of our clients to pop over for a tour, here are just a few of the more impressive machines employed at Custom Print Products. 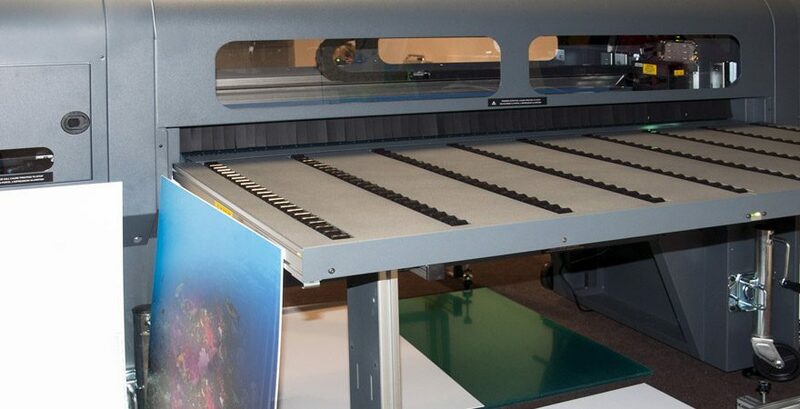 HP Scitex FB700 flatbed/roll-to-roll UV Printer – With a 98.4” wide print area, and the capability to handle flat stock or roll material, this print machine knows how to make large graphics. 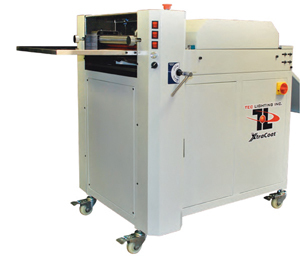 d.gen Model 1377FU/74-F1 Fabric Printer – Need a banner? How about a custom flag? We got you covered. d.gen revolutionized the direct to fabric printing method, so of course we had to get one of these. 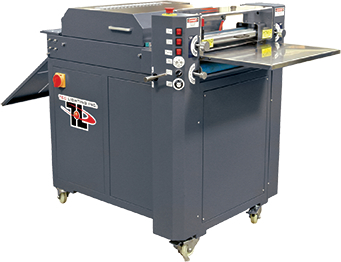 Graphtec FC8000-160 Cutter – The industry standard in cutting plotters, Graphtec cuts vinyl and other graphic material with the precision of a samurai master. Vinyl lettering and intricate shapes are no problem, up to 64 inches wide. HP Latex 360 Printer – Printing on traditional signage substrates has never been greener. The HP Latex series uses odorless latex inks, which are environmentally friendly and colorfast for 3 years without lamination! AXYZ Pacer 4010 CNC Router – Our sign making business really took off with the addition of the AXYZ Router a few years back. Handling non-ferrous metals, wood, plastics and much more, this router boasts a 60” x 120” flatbed and 3-axis router head. There are more printers and finishing equipment in our shop, but they are just more top-of-the-line machines that perform similar functions. Running a print shop alongside the equipment supply store has many benefits to our customers. Think of it like an auto dealer with a service department. You trust the sales team more because if you have any issues, the people in the other department know every nut and bolt in your vehicle. Similarly, we use the printing and finishing supplies we sell in our own shop. We also use and maintain the equipment we recommend. Through the years, we determined the best products to offer our customers through our own experience. When you call in to Custom Print Products, you can speak to the people who work the machines and use the supplies sold by Lloyd’s of Indiana. When you call Lloyd’s for equipment or supplies, you can talk to the people who use those items at CPP. You can trust the recommendations from any of our associates because we live for the printing industry. After 30 years in this industry, we know how to make your projects look fabulous. So, by now you should have a good understanding of what Custom Print Products is all about. To avoid confusion with the product offerings from Lloyd’s of Indiana, we run our printing operation under the name Custom Print Products. We chose the name Custom Print Products to reflect our business model of tackling short run jobs, often one or two pieces. Each job that comes through is treated with the importance you demand because each project is unique. We don’t churn out thousands of campaign signs a month. We produce your project, for you, when you send us your custom artwork. That’s it. Plain and simple. If you haven’t spoken to us recently, we would love for you to give us a call to see how Custom Print Products can make your next project outstanding.